I’ve just published the latest update for Mizuu on the Google Play store, and it should be available within a few hours. A lot of stuff has changed since the last update roughly one and a half month ago. Google introduced a bunch of new stuff and had a lot of developer sessions at this year’s Google I/O, and I’ve been working at implementing some of the stuff from there. I haven’t managed to complete all the stuff I had planned for version 2.3, but it’s still high priority stuff and it’ll come in the next updates. That being said, there’s still plenty of good stuff in today’s update. I’ll briefly go through some of the changes, and you can find the rest in the change log below. This has been a requested feature since network support was introduced and it’s now enabled. It basically means that you can now use .nfo files, custom cover art and backdrop images for your network files. With this feature enabled, you’ll experience slightly slower loading of images since they’re not being loaded from your device, but I’m using a relatively large cache that should help once they’ve been loaded. The widgets currently don’t support custom cover art from network shares, as I’m going to re-write and improve all the widgets in one of the next updates, so I’ll include with that coming update. With the previous version of Mizuu, you’d get movie ratings from www.themoviedb.org and TV show ratings from www.thetvdb.com. While both sites have a lot of good data and information about movies and TV shows, they’re not known for having the greatest audience to provide ratings. With version 2.3 I’m opening up for more data sources, so you can get ratings from other sites. The latest version of Mizuu will by default use Trakt.tv for its movie and TV show ratings. The Trakt community is generally happy to rate the content on the site and the ratings are pretty good. It doesn’t end there, though. With the new release, you’ll also be able to get ratings from OMDb, which essentially get the ratings from IMDb. You’ll be able to set your preferred data source for both movies and TV shows in the application settings. The algorithms to recognize patterns and data in file names were greatly improved with this release. It’s something that I spent quite a lot of time on, and after having successfully passed well over 1,000 different tests with a large data set, I feel confident that you’ll get better results now. I can’t really describe many of the changes without going into very technical terms, but the new algorithms are considerably better and more flexible. In the future, it’ll also be possible to add support for TV show files that contain multiple episodes in a single file. NOTE: I’ve likely forgot something, so the above list might be incomplete. I’ve set up a site for people who are interested in translating Mizuu into other languages. You can find it at translate.mizuu.tv (or using the link at the bottom of this website), and it’s pretty easy to get started. There’s a short description of what you’re expected to do at the site. I recently published a blog post about the idea of having a single version of Mizuu. It was a long read, and I’d like to thank you for the more than 100 comments and e-mails I received in response to the post. I received a lot of ideas from the users and a lot of advice. I’m really grateful for that. A suggestion that popped up a few times was to simply remove the free version and only make Mizuu available as a paid application. Truth be told, it’s something that I’ve been considering for quite a bit of time. This may come as a surprise to some of you, as I’ve always told you that I’m not in it for the money, which is still very much true, but there’s some pretty solid reasoning behind it. I spend quite a lot of time on Mizuu. Not just developing, but answering e-mails and helping people. Most weeks I spend anywhere between 50 to 100 hours on it – yes, you read that correctly. This has been possible for the last six months or so due to me cutting back on school for the semester and losing my job in January. It really won’t be possible for much longer, as I’ll soon be starting school again full time and I’ve also been getting quite a bit of work lately. About half of the people contacting me for help or support are using the free version, and it can be quite time consuming. Maintaining the free version obviously takes time as well, and with my limited available time, that’s time that could be spent developing new stuff rather than just copying over old stuff. I really can’t spill the beans on the ad revenue of the free version, as that’s against the EULA, but it is ridiculously low. I do value my time, and at this point it’s simply not worth my time and effort, especially now that time is of the essence. Over the last 30 days the paid version has generated 236 times the revenue of the free version. 236 times! And that’s with an active userbase that’s almost three times less than that of the free version in terms of volume. Some of you may be thinking that the revenue from the paid version is spiking through the roof, but no – the ad revenue is simply that low. Besides, I really dislike ads and I never really liked the idea of adding ads in Mizuu. In addition to this, the free version has a significantly lower rating on Google Play than the paid version, mainly because more people install it without reading the description or knowing the purpose. Most people think twice about buying something, especially if they’re not sure what it’s for. I really care about Mizuu’s rating and it pains me when I receive a low rating because someone didn’t read the description. With that said, I’ve decided to make Mizuu available as a paid application only. Before committing to a purchase, you should obviously try out the application – especially with something as advanced and extensive as Mizuu. That’s why I’m offering a 72-hour (3 day) refund window for all customers. Simply send me an e-mail if you’re unhappy about something, and we’ll either work it out or I’ll cancel the purchase and refund the money. In most cases, I’ll be cancelling the purchase before the money is even withdrawn from your bank account. So, hope you’ll enjoy the new version and let me know what you think! That all sounds OK to me. Thanks for the HARD WORK Michell. Good decision! You should make the free-for-3-days part very obvious in Google Play, I think. ‘Free’ is always more attractive to try something. And I really like the newest improvements, by the way, especially the OMDb ratings. I think its the right decision on the paid vs free. I’ve just recently picked up the app after a long hiatus and must say its improved immeasurably. We had a discussion a while back on ‘watched’ shows and so grateful this is now in. I’ve just recently found Trakt as I was getting sick of trying to keep my watched lists in sync between xbmc and my Nexus 7. The pre-integration with Trakt in Mizuu is what brought me back and I’m so glad I did. Keep up the great work !! Couple of suggestions for improvements ( I can add these to the suggestions as well). Firstly, not sure if this possible in the android SDK, instead of making the library updates scheduled can you set it to monitor a directory instead. That way when I load new content it automatically updates the library. Second, and this is purely about reducing the number of clicks, would be good when I click on a show for it to go straight to the show list rather than the summary of the show (was sure this used to be an option, but I can’t see it any more). It’s not possible to monitor files using the Android API, so scheduling is probably the best option for now. Michell you’re stellar. TV identification is now MUCH better. Great to hear! If you still experience issues with particular files, I’d love to hear about it, so I can (maybe) make it work as well. Glad you decided to kill the free version and have a standard paid app. In my house, we have 4 Xooms that all use your app regularly and dealing with a normal paid app is simplest with many devices. I also put it on my Galaxy Nexus for kicks and giggles and was surprised how well it looked on a handheld screen. You mentioned updates are coming to the widgets. Please don’t abandon the cascading widget. I find that presentation very useful and have installed the cascading Kindle widget and Gallery widget,too. I won’t be abandoning any of the widgets. The plan is simply to improve the code, implement some new stuff and perhaps make some minor visual changes. Great decision to stick to 1 paid version only. I would love to have this on my iPhone as well. Do you consider porting it to the Apple app store? However, since the last release, when I updated my libraries, alot of TV episode information went missing. It was all there in the past, but now is gone. Also some dvd tv releases, such as Top Gear Specials, can no longer be found. A few can be found, but in previous versions all Top Gear stuff was readily identified either in movie searches or as tv. Even if you try to identify the movie through the search, most cannot be found. How are your filenames named? You should always add your TV shows folders as folders containing TV shows when adding file sources. Don’t add them as movies. Thanks for the amazingly fast response! First let me say I have tried every other app on the play store and none compare! I have not changed the file structures nor naming conventions. And no matter if you search under movies, or tv shows, you get the same results. Try finding “Top Gear – The Great Adventures 2”, or any of the specials released on DVD. I am a big fan of the show, and I initially choose this app because it found and listed each episode and each dvd. Dvd’s were found searching under movies. BTW, naming convention is “/TV/top Gear/Season/ Top Gear S## E##” for tv shows, movies are listed in their own directory. Regarding your naming convention… Do you have multiple folders for seasons or just one called “Season”? Okay, thanks for the info. All I can say, is that the app found a lot more prior to updates, but it may be the IMDB. BTW, I use multiple folders for seasons, and some series are identified as in the past, but others are not. Thanks for the response and your help. Have you tried simply clearing the library and updating? Your TV show file naming is perfectly fine. There’s nothing I can do regarding the movies – they may or may not have been in the database previously, although I couldn’t imagine why it’d be removed. Yup, did clear the library etc. If you run this link, they all show up on IMDB the way they used to show up in the app. I can’t find “Top Gear The Great Adventures 2” on IMDb. I’m not sure why you keep referring to IMDb, as that isn’t and has wasn’t previously used in Mizuu to find any titles. Any regression in terms of your specific Top Gear titles isn’t due to the update, I can tell you that much. It works just fine with your filename convention. If anything has happened, it’s been with the movie or TV show database, and the timing has been very unfortunate. If you can somehow create a text file with the full path of all your Top Gear episodes / movies, I’ll be happy to try and replicate your results. Ok, this is a HUGE update for Google TV. Instead of waiting 30-60 seconds for the thumbnails to slowly trickle in, they come up VERY quickly now and makes Mizuu much more usable for GTV. Excellent work, Michell. love the app and good decision to only have a paid version. is there a way to have movies that have a 1 of 1 and 1 of 2 in the folder to only sjow as one movie? it makes my library show doubles? I confirm that Trakt.tv is selected under “Source for Movie Ratings” in “Identification & search”. However, it does not seem to apply. For example the movie “V for Vendetta” rates 7.9/10 in my Mizuu’s overview window, while it rates 88% on the trakt.tv site, 8.2/10 in IMDb and 7.5/10 in TMDb. So where does the 7.9 in Mizuu come from? Is it an average of IMDb and TMDb? How can I get the rating to reflect Trakt’s rating as set in the “Source for Movie Ratings” option. You mention “Mizuu’s overview window” – are you talking about the library overview here? If so, are you sorting by weighted rating? I’ve checked the Trakt and OMDb ratings many times, and it’s definitely working as intended, so it does sound a bit strange. Might be able to add a link to Trakt like IMDb. Mizuu’s overview = movie description = the page that gives the details about a movie, eg. summary, year, rating, etc. That does sound quite strange. That should only be possible if you’ve manually changed the rating when editing the movie information in Mizuu. 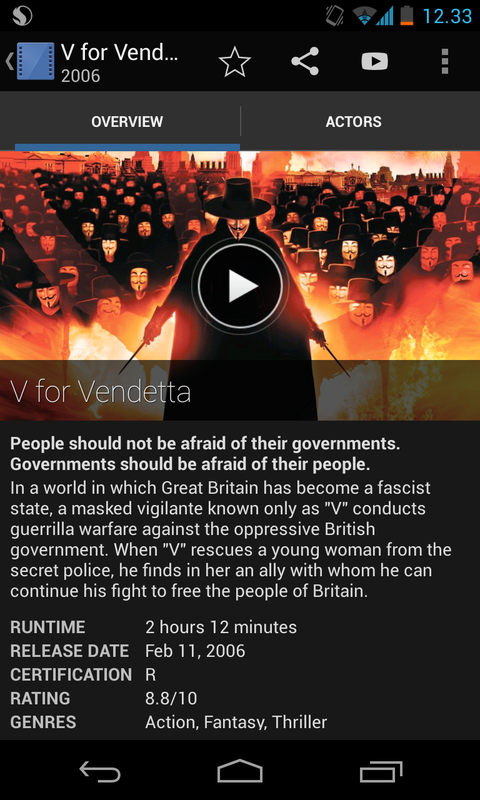 So what rating do you get in Mizuu for the movie description of “V for Vendetta” when you check Trakt.tv in “Source for Movie Ratings”? Can you send a screenshot? Are you sure you’re not using a .nfo file for that movie? None of the data sources have that rating. I simply don’t see how it’s possible without either using .nfo files or manually editing the rating. * when I change the rating system from trakt to imdb then update the library without checking “clear library on update”, nothing changes, eg. trakt rating continue to be displayed. * what’s in “weighted rating”? Also I find it amazing to see the difference in ratings between trakt and imdb, even with a large enough number of votes in both cases. #1: Yes, that’s how it’s meant to be. Only ratings from the selected data source is downloaded when updating the library, so changing the setting without re-updating your library won’t change a thing. I have no intention of changing that. #2: It’s an attempt at giving higher priority to movies you’ve watched or favorited. A movie may have a low rating, but if you’ve favourited it, it’ll be given a higher rating. #3: I currently have no plans to show either vote count or votes from several data sources at a time. #1 I do update the library – it just does not update the rating. It will when you clear the library. Like I said, it has to fetch the data again – that’s only possible when clearing the library. In addition, could you add a direct link to Trakt: “Open in trakt.tv” as you have “Open in IMDb”?